Today (Sunday, October 30th) our twin grandchildren, Daynica and Josiah, are celebrating their 7th birthday. Nicole and Tim are the proud parents. 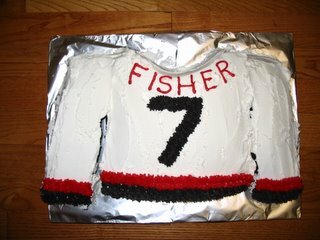 To add to the celebration, Mike Fisher scored a goal and an assist in the Senators' 8-0 thrashing of the Maple Leafs. Ironic that a former Thrasher, Dany Heatley, would score 4 goals to help the cause. We'll tell you more about the Heatley connection later. Here's a photo of Josiah's birthday cake! Note the Senators' colors. Happy Birthday Daynica and Josiah! We love you!